The Sidebar: Surgeon General Regina Benjamin: C. Everett Koop's 1985 pro-Heimlich statement (based on Ed Patrick's junk research) "probably needs to be looked at"
Surgeon General Regina Benjamin: C. Everett Koop's 1985 pro-Heimlich statement (based on Ed Patrick's junk research) "probably needs to be looked at"
It took me months of e-mails and phone calls, but last Thursday I had a half-hour phone call with outgoing US Surgeon General Regina Benjamin about her office's policy on the best way to respond to a choking emergency. The American Heart Association and American Red Cross criticized Dr. Koop, but later followed suggested guidelines by only teaching the Heimlich. In 2005, the AHA and ARC changed their position by stating that “back blows, abdominal thrusts and chest compressions are equally effective” treatments for responding to a choking emergency. 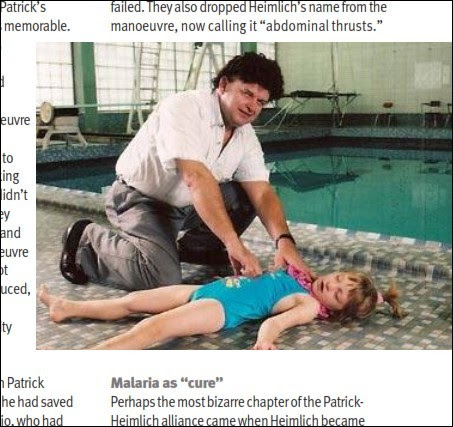 The Red Cross stated that there is no clear scientific evidence to say that one technique is more effective than the others when treating a choking victim. Per my June 10 letter to Dr. Benjamin, I've been trying to find out if the Office of the Surgeon General still stands behind Dr. Koop's outdated claims. During our call I found Dr. Benjamin to be down to earth and easy to talk to. She explained that current governmental procedures are more complicated than in Koop's day -- no surprise there -- and that evaluating and processing new recommendations required months of reviews by committees. But she did tell me that my inquiry "sparked out interest to start thinking about it...I certainly think it's an interesting topic that probably needs to be looked at." Next week is her last week on the job, but she offered to share the information with the Acting Surgeon General, so we'll see where that goes. I also explained my concerns about the evidence on which Koop said he relied -- unpublished research by Dr. Edward A. Patrick, my father's shady 30-year crony whose one-of-a-kind, full-page obituary in the March 13, 2010 British Medical Journal sounds like a character from The Simpsons. Two 1985 news reports about Koop's "pro-Heimlich" statement (Washington Post, Pittsburgh Press) identify Dr. Patrick as a professor at the University of Cincinnati. Dr. Benjamin asked me to send along that information, which I did in the following letter which raises obvious questions about Dr. Koop's due diligence. "Koop was an old friend of my father's, and he did it as a buddy favor." Note: I've revised this item a few times.